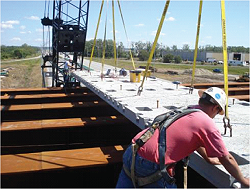 Using accelerated construction methods, a prestressed, precast bridge, was constructed the by the Iowa Department of Transportation (DOT). The design concept involved the use of precast deck components that were grouted compositely with the steel girders. The successful implementation of this approach has far reaching implications in Iowa as well as nationwide, as there are many instances where proven rapid construction techniques could result in significant reductions in costs. The overall objective of this project was to assess bridge components and evaluate the overall performance of the 24th Street bridge. In order to complete the objective the project included laboratory test and field testing. The laboratory test included evaluating the shear stud pockets, (including the stud bend test and grout flowability), evaluation of duct splicing performance, and the influence of surface treatment on transverse joint shear transfer. The field test included monitoring strand corrosion, deck panel behavior during placement, post-tensioning strand behavior, and a diagnostic live load test.